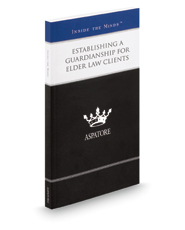 Establishing a Guardianship for Elder Law Clients provides an authoritative, insider's perspective on best practices for navigating elderly clients and their families through the complex world of guardianship law. Partners from some of the nation's leading law firms guide the reader through process of providing elderly clients with maximum care and protection, while leaving them with as much autonomy and independence as possible. These authors explain that, as the American population ages, guardianship proceedings will become increasingly common. They describe the importance of approaching each case individually and maintaining sensitivity to the parties' often conflicting interests, while focusing on the main goal of protecting elderly and vulnerable adults from financial exploitation. The different niches represented and the breadth of perspectives presented enable readers to get inside some of the great legal minds of today, as these experienced lawyers offer up their thoughts on the keys to success within this evolving field.